Yesterday I was privileged to attend my cousin's graduation ceremony from DePaul's College of Law. To be honest, initially I was not looking forward to attending this event. Not because I wasn't proud of my cousin's magnificent accomplishment, mind you; but because of my own physical aches and pains, and the hassle life becomes when you are trying to negotiate a limited physique around the likes of several hundred "pumped-up" family members and celebrating college graduates posing under the roof of one large public venue. But I went... and, of course, I'm so glad I did. For not only did God work out every detail, but He further blessed me with the entire experience. You see, early in the event the Holy Spirit impressed upon me that I was sharing a room with over 4200 people - all who were there to experience the same moment of joy, pride, and love with their own fellow family members and friends. It didn't matter if we came from Nigeria or a nearby suburb. In this moment, in this place, we were all connected. For we each had a graduate to acknowledge... and acknowledge we did! With every name read... with every diploma handed... with every hood dressed, we all cheered! Throughout the room, pockets of groups whistled loudly and applauded with delight as their own graduate completed the final stage of their law school education. Yes, for each of us, someone we adored was being recognized for something wonderful - and we were all thrilled to enjoy the moment together. It was indeed nice to experience the joy of achievement and pride of every family member as they cheered on their related graduate yesterday. And it got me thinking: I wonder how graduation day will be in Heaven when we share it with our eternal family? How will we enjoy celebrating the happiness of every believer's race well won - Christians who lived in devotion, obedience, and deliberate purpose toward magnifying the glory of our God's kingdom? 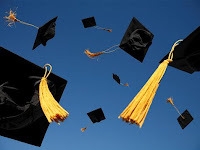 Won't it be incredible to see each child of the King receive their diploma and eternal crown of holiness, hooded personally from the nail driven hands of Jesus our Savior? Yesterday, some of the most touching moments occurred when faculty members were able to perform a "legacy" hooding with their graduate - - meaning a parent (who was a faculty member to the college) could hood their own child. How beautiful to be part of such an inheritance! To be formally escorted, acknowledged, and decorated by your own proud mama or papa. Words escape me to describe the immense pride accompanying this honor, and my heart yearns for that glorious day when I can experience the same delight with my Heavenly Father. For His decoration and acknowledgement is all I seek. His legacy is eternal. How I long to be kissed and hugged by Him. Believer, how cool will it be to have Him proudly present each of us before our eternal love-one's, claiming, "That's my girl!" or "That's my boy!" Yes, yesterday I was blessed with the realization that I too would graduate one day from law school. I would advance on into eternal holiness, with sin overruled, to enjoy a new day decorated by the One who is the greatest Honor of all life. Such joy cannot be contained, for real justice, and freedom, and community, and peace is available in Him alone... by His grace... because of His eternal love! How much I look forward to seeing His tears of pride, relief, and happiness. How elated I will be to hear Him acknowledge me with, "Well done, my good and faithful!" As such, today I will honor Him by making every effort to live obediently like my Jesus... for my graduation day is coming! The DePaul president concluded yesterday's ceremony with this important point. He said that as a university, DePaul would be happy for every graduate that finds the things they have always hoped for in this life... a nice family, job, house, car. Sure, they would be happy to see such blessings happen for every single graduate. However, and more importantly, they would be proud of every graduate that actually went out and made a difference with their life - - to love others, to help others, and to represent the image of their prestigious college accurately and with thoughtfulness - no matter what trial or opposition must be faced. Yes, such a life would make them proud of their law school graduate. Such a life would make our Father proud of His graduate too. So, let us live such a life! Let us live today representing His rich image to those lost and less fortunate. Let us care and share for His Name's sake - always standing for what is good and right! Let us run this race to the end and graduate with full honors, Believers! This is the day to rejoice, for we are assured as His children to one day celebrate together in ceremony. There, we will all be personally hooded by Jesus and given His eternal legacy of grace and holiness. We will congratulate and cheer for one another as we are honored by Our Honor, The Almighty King of kings! Hallelujah! Our graduation day is coming! So, let us make every effort to learn from our Teacher and love like He loves!